Any homeowner with patio doors understands the hassle of maintenance and cleaning. Renewal by Andersen® of Kansas City patio doors are built for both beauty and durability, requiring less annual upkeep and saving more energy than your run of the mill, off the shelf patio door. Here at Renewal by Andersen® of Kansas City we install both French and Sliding patio doors for Renewal®. When you turn to us as your contractor, we will work with you to decide the right style for your home. There is no secret to the superior features of Renewal® patio doors. They are simply built from higher quality materials. Renewal® patio doors are constructed from advanced Fibrex™ frames and Low-E glass packages, making them more durable and energy efficient than any other patio doors on the market. And while older wood or vinyl patio doors may lose their looks over time, Renewal® patio doors will look factory fresh a full decade after installation. No matter what door you choose, it is the installation of your patio doors that makes all the difference. An improperly installed door will do more damage to your home than good, leaking costly energy and often leaving unsightly scratches in your floor or on your walls. When installed by a fully certified professional from Renewal by Andersen® of Kansas City, your Renewal® patio doors will swing open and closed with the touch of a finger, never scraping into your floor or sticking in its track. This ease of use leads to higher energy efficiency and less hassle for you, the homeowner. Don’t go another season with unyielding, unsightly patio doors. Choose new patio doors from Renewal® and see the difference a top quality door can make in your life. 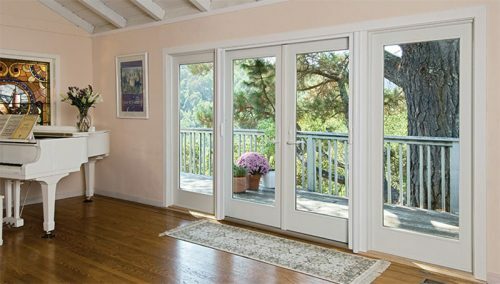 For a FREE estimate on Renewal by Andersen French doors in Kansas City, schedule a FREE in-home consultation by calling Renewal by Andersen® of Kansas City at (913) 385-1300. Or simply complete our handy request form.